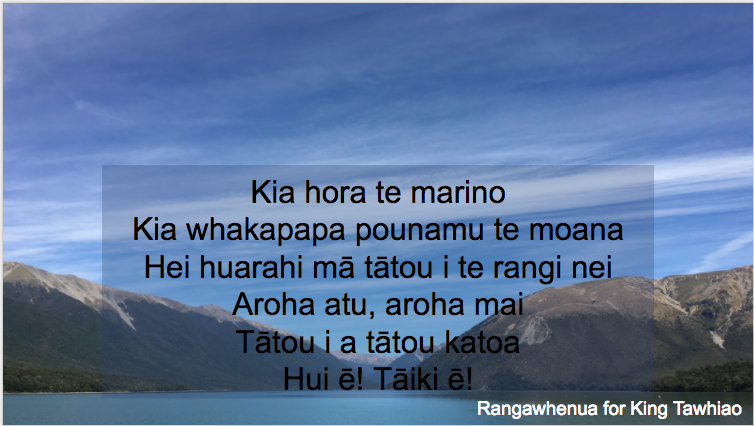 What: As I begin a presentation to a group of teachers I always include a whakautukī ia the beginning in recognition on tangata whenua. This one is a favourite of mine as some of the learning that I am presenting can be challenging and the wish that by working together the potentially rough waters can become smooth like pounamu is a good one. As we work together we will overcome challenges and the way forward will become clearer. So What: Although I understand simple te reo and my pronunciation is not awful my confidence is not as good as it could be as I feel that I will be criticised for imperfections as has happened in the past. 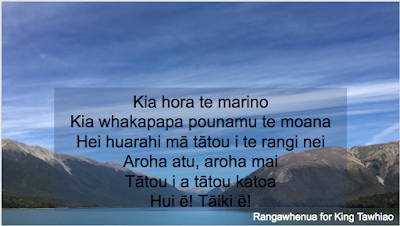 By having the whakatauki written down it prompts me to practice and hopefully sets a positive tone of inclusion for the rest of the presentation. What other words related to schools and learning could I incorporate in my presentations??? 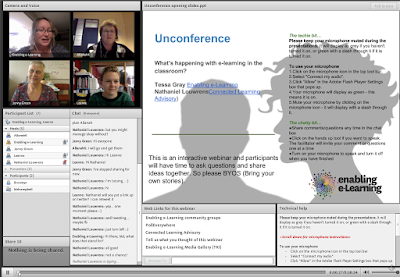 A couple of weeks ago I offered to participate in a VLN unconference webinar. 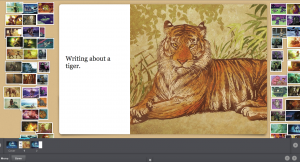 I hadn't done anything like this in a while and it appealed to me because of the the learning I had done recently around the use of Storybird so I was able to share that fairly simply using the the work and images that I had already put together. Click on the image to take you to the show notes from the webinar. And here is the link to the webinar itself. I see in the Practising Teacher Criteria there isn't really anything that takes us into the R- Redefinition part of the SAMR model. I think we should share our reflections and resources more. 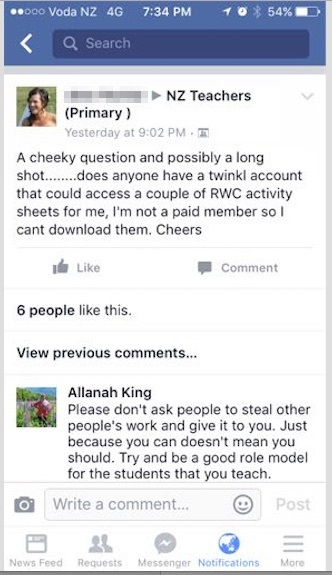 I have been dismayed recently by blatant thieving channelled through the NZ Teachers' Primary School Facebook page. 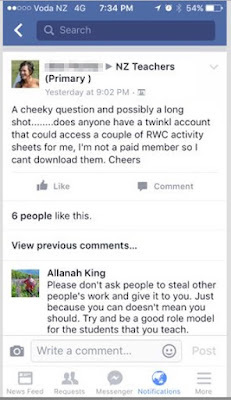 I think we need to share our work ethically and responsibly though and the VLN is a good place to do this. I was dismayed also at the negative reaction to my comment for the teacher who got people to give her paid resources that she was not entitled to. I think more people still need to share more of their practice and participating in these sorts of things gives us the courage to do more, share more. Establish and maintain effective professional relationships focused on the learning and well-being of ākonga. 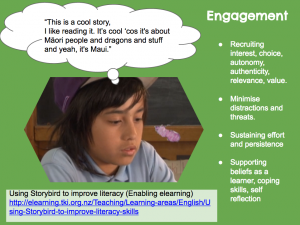 Through our classroom Moturoa blog I have always encouraged feedback and participation with others from outside the classroom. The blog is soon to be ten years old and has moved between schools as I have moved. In that time it has clocked up over 126,000 views. I particularly appreciate the comments that it attracts that encourage us to keep on posting - knowing that we have an authentic audience. Here are some recent examples, via email and blog comments. It has taken time to build up these interactions. We post regularly to the blog so that there is new material happening there all the time. There is always something new to look at. 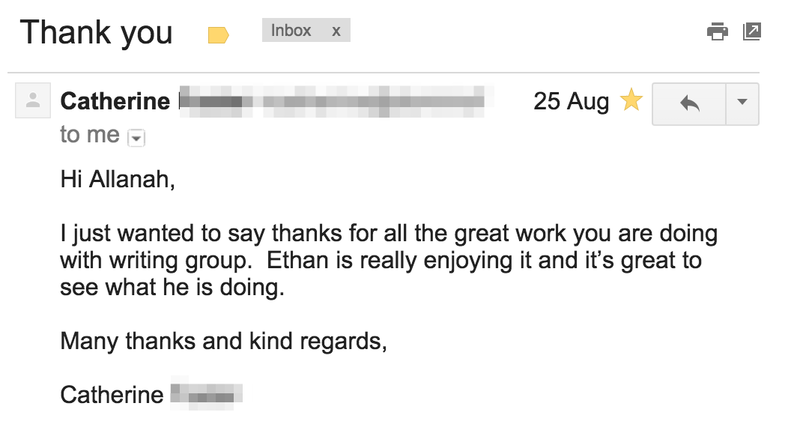 I send home newsletters to whānau sharing the blog address and inviting interaction. If I child does something published to the blog they take the URL http://moturoa.blogspot.co.nz/ home to remind family and friends to share in it. I make sure that the children take a moment to read the comments and know that people outside the classroom are watching and sharing in their progress. I invite friends and workmates to comment to be exemplars of commenting so people get the idea. We celebrate commenting and encourage more of them. It would be lovely if we could have some actual community visits but the blog comments are much appreciated. I try and trial a variety of prompts for writing. Using Storybird is one of those tools I decided to trial. I recently was preparing a workshop for teachers around Universal Design for Learning and student engagement and was doing some research. 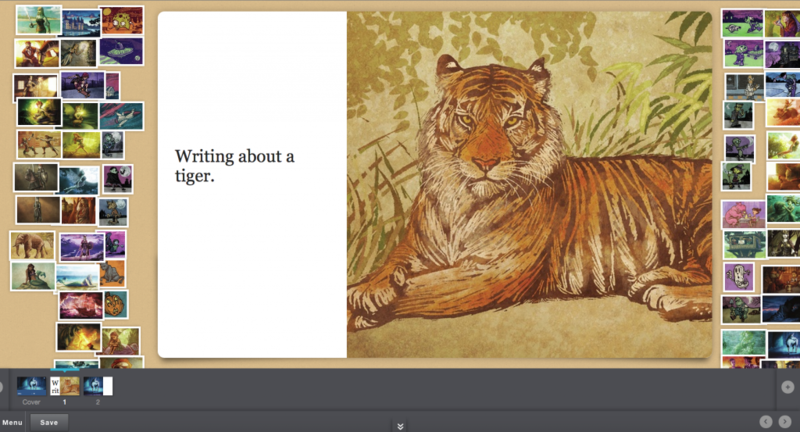 An article on TKI mentioned Storybird as a vehicle to engage reluctant learners in writing. I never like to recommend something without giving it a trial for myself. Fortunately I teach at a local school as well as being a LwDT Facilitator so had some willing learners to help me trial the tool. I registered myself with a Storybird account and to keep things simple I manually entered the students names into Storybird and then set about changing the passwords that Storybird had assigned students and aligned them with the students’ Google Accounts. This took a bit of time but paid off with fewer students having to be reminded of what their passwords were. All of the writing activities we try need to be accessible on a variety of devices as I have Chromebooks, Mac Books and iPads to use and not enough of each to be exclusive. Storybird works well on all of these devices. To access the Storybird website on the iPad I made it into a shortcut on the home screen and on the laptops it was linked from our Moturoa blog. Once all that was set up I made a practice picture book myself so that I would be one step ahead when we used it in class. In introducing the concept to my boys we said we will trial it for a few weeks and they can give their verdict on it. We cracked into it. On first reflection I was underwhelmed. The idea is that you get a selection of images to use, select one and then use the images produced by that particular artist. You can search for images from a topic to get you started but my boys wanted to write of motorbikes and rugby and there were no images related to those sorts of topics to choose from. You cannot pick and mix the artist. Once you select one artist you can only use other images that that person has created. We pushed on as it was a trial. Although the illustrations were stunning some of the boys were reluctant to pick anything as none appealed. In the end they picked something and used that although it wasn’t a choice that initially engaged them. Few of the images lent themselves easily to building a narrative sequence so some of the boys just wrote captions for the random images that engaged them. Some however really engaged with the Storybird concept and managed to relate the images together to do quite a good semblance of a narrative. After the writing and editing was done the boys pushed SAVE and PUBLISH and I was able to easily publish it with the provided embed code. To spice things up a bit we also had a competition with voting via the blog to decide which stories we like best. Once engaged some boys really involved with the process and showed an interest in working on it at home. You can invite others to work on the stories collaboratively but we never really went down that track. You can read and reflect on other people’s writing by leaving comments which can be moderated. 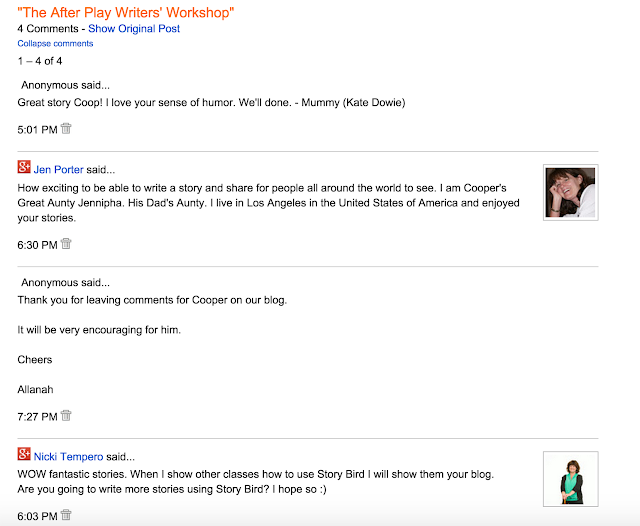 As a final reflection I was thrilled when a parent joined in and made another book at home with her child and invited me to collaborate on it with her and she left a comment on the blog post. Wonderful work and writing. This has opened up a whole new world of e-learning to me and I’m loving it I’ll be back for more! To share our progress with Storybird I intend to share the above presentation to the VLN Unconference Webinar next week. PTC1- Establish and maintain effective professional relationships focused on the learning and well-being of ākonga. I lead a staff meeting about the Practising Teacher Criteria. I constructed this set of Google Slides as a resource for teachers to refer to as they were learning and to refer to after I had left, making the session rewindable. 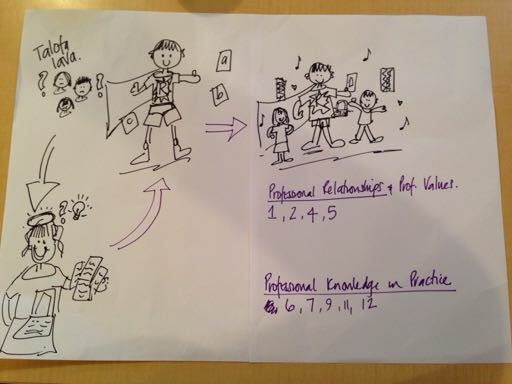 We completed a Story Hui Process to help us identify which PTC our practice shared. In the presentation I started with a whakatauki that supported the work that was yet to come- that as beginners we might find all this blogging business as challenging but if we all work together and support one another a collective understanding will prevail. By leading the staff meeting in this way I was able to demonstrate my leadership in a professional way, with positive feedback on the usefulness and relevancy of the presentation and examples shared. 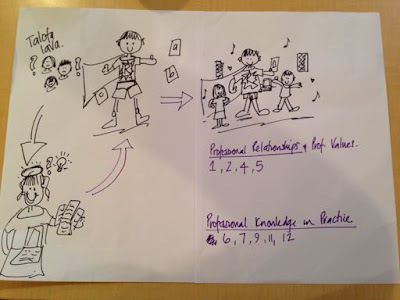 I decided to build this blog into more than a just a demo of how evidencing PTC might work. I added the actual text of the PTC as Pages along the top of the blog so people could easily copy the text rather than having to refer to the PDF of the Practising Teacher Criteria. I will endeavour to add to this blog over time to build it as a resource for both myself and others who may wish to view it. PTC 1 - Establish and maintain effective professional relationships focused on the learning and well-being of ākonga.